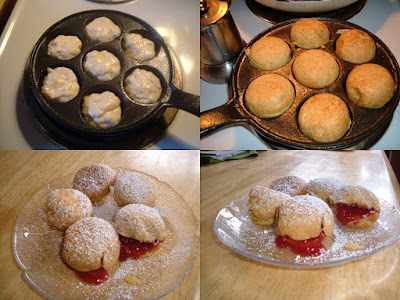 "Not quite a doughnut and not quite a popover, an ebelskiver ( pronounced "able-skeever") is a light, puffy, filled pancake cooked in a special pan on the stovetop." 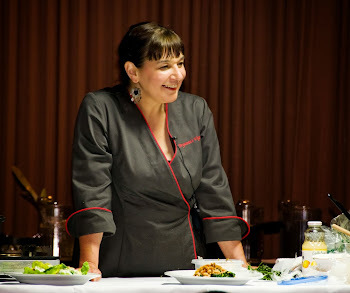 http://www.sj-r.com/article/20130424/News/304249903 And, I might add, no oven is necessary and no frying is involved! 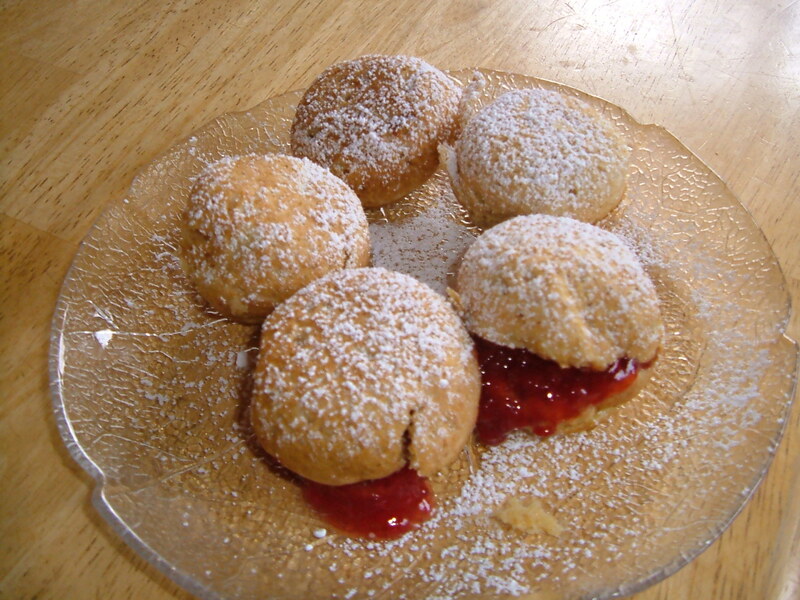 Aebelskivers (the more common spelling) are Danish pancakes cooked in a special pan with deep, round cavities so that they emerge as small "puffs", or "balls", which are traditionally filled with an apple slice, or, more recently,applesauce or jam, and dusted with confectioner’s sugar. The round shape is achieved by a special method of rotating the cooked dough to the top of the pan (explained in the recipe-- and not as hard as it sounds! ).This makes a novel treat for children and adults alike. 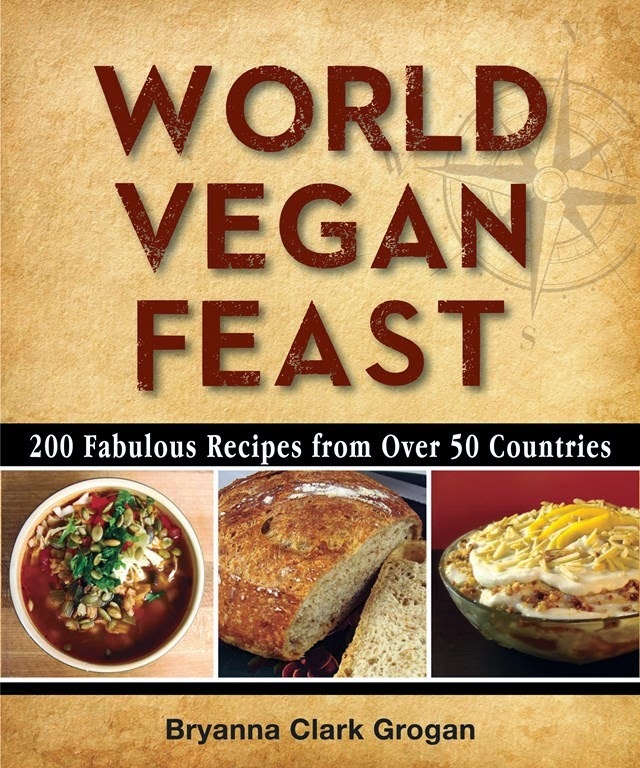 It would be fun to experiment with all sorts of sweet and savory fillings-- vegan cheese or thick cheesey sauce, for instance, or fruit butters and curds, vegan caramel sauce, vegan chocolate sauce or hazelnut/chocolate spread (a vegan version of "Nutella") or whatever you fancy. 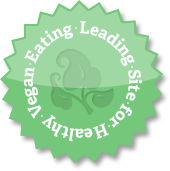 I developed this vegan batter about 10 years ago and somehow it never made it to this blog! I was reminded to post it by an old friend who originally sent me the special pan from California. I hope you'll give it a try-- if you have children in your life, they will love them! Note: This vegan batter is thicker than the traditional egg-y aebelskiver batter. I tried thinner batters and they resulted in soggy centers. Cooking Tip #1: Corn flour is not the same as cornstarch (confusingly, what we call “cornstarch” in North America is referred to as “corn flour” in the UK) — it is very finely-ground yellow cornmeal. You may find it in the Asian or Indian section of large supermarkets, but also look for it in Indian (South Asian) markets and health food stores (Bob's Red Mill brand, widely available in North America, has it). If you can’t find corn flour, or if you prefer to use organic products, grind the finest yellow cornmeal you can find in a clean coffee/spice mill until it is powdery, or grind yellow cornmeal on the finest setting of your electric grain mill (I had to run it through mine twice). Cooking Tip #2: To avoid competing tastes and odors, deodorize your coffee or spice mill by grinding several tablespoons of white rice to a powder in your mill and then discarding it. The rice powder will absorb the residue and oils, which contain flavors and odors. 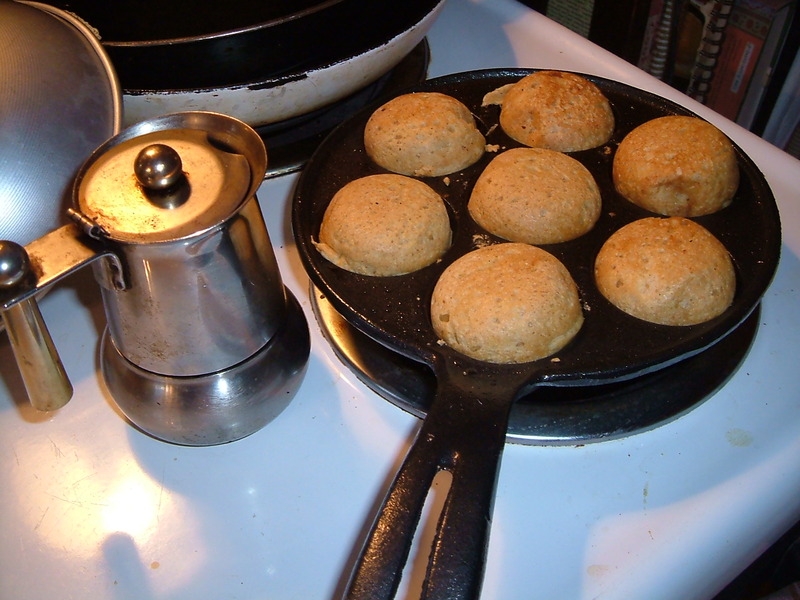 There are several models of aebelskiver pans and they are, surprisingly, not hard to find online! Mix the soy, hemp or nut milk with the lemon juice to make vegan “buttermilk”, and set aside. Mix together the Dry Ingredients in a medium bowl with a whisk. Set aside. For the Egg Replacer, mix together the water, ground golden flaxseed, and egg replacer powder with a hand immersion blender or electric egg beater until like a thick, frothy egg white. Add the oil and 2 tablespoons nondairy milk and mix briefly. Pour the "buttermilk" and the flaxseed mixture, into the dry ingredients and whisk briefly just until no dry flour is visible-- it will be lumpy and quite thick. 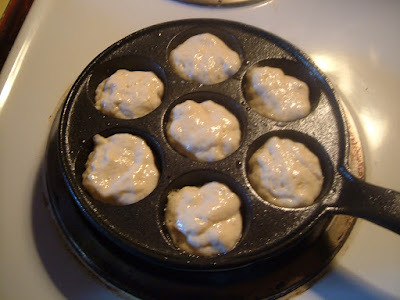 Place the aebelskiver pan over medium to medium-low heat. When the pan is hot, brush the depressions (cups) in the pan with melted vegan margarine or spray them generously with oil from a pump sprayer (even if your pan is nonstick!). Fill each cup to slightly below the top with batter. My pan comes with a small dome lid, which I place on top during the first half of cooking. If your pan did not come with a lid, you can improvise with other lids you have around. The cooking time will vary with your pan (the size and what it is made of), and your stove, but it may take about 5 minutes per side. 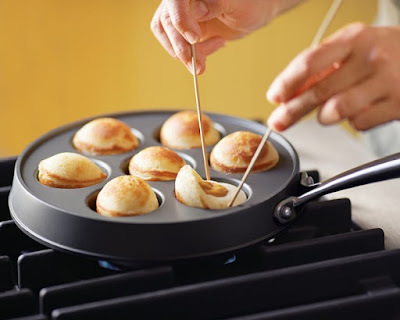 To rotate the aebelskivers: Let one side of the batter cook, covered with the lid, until the bottom is golden brown and crisp, then pierce the crust gently with a bamboo skewer and carefully pull the pancake all the way around so that the golden brown part is on top. Cook, uncovered, until the second half is golden and crisp, then carefully remove the balls from the pan with the skewer and eat hot. To make filled aebelskivers, fill each cup of the aebelskiver pan only halfway, using half of the batter. 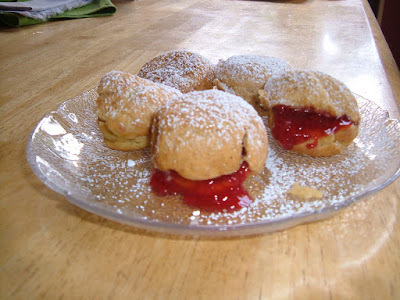 Place one level teaspoon of whatever filling you want into the center of the batter in each cup. Spoon the remaining batter over each cup to cover the jam. (See photo above.) Proceed as directed above. To serve, sift confectioner’s sugar over the hot aebelskivers (unless they are savory ones). If you did not fill them before baking, split them with the tines of a fork and fill them with jam, applesauce, or sautéed apples. This is the time of year that I switch from making soup several times a week to making hearty full-meal salads with whole grains, potatoes, pasta and noodles, or sweet potatoes, with beans or tofu or other vegan protein and lots of vegetables (and sometimes fruit-- fresh or dried-- and nuts). This ensures that we have something ready-made, nutritious and tasty in the refrigerator at all times for quick meals or snacks. These recipes are two that we have enjoyed recently-- one an old favorite, and one new, made up to utilize what I had in the freezer and fridge. 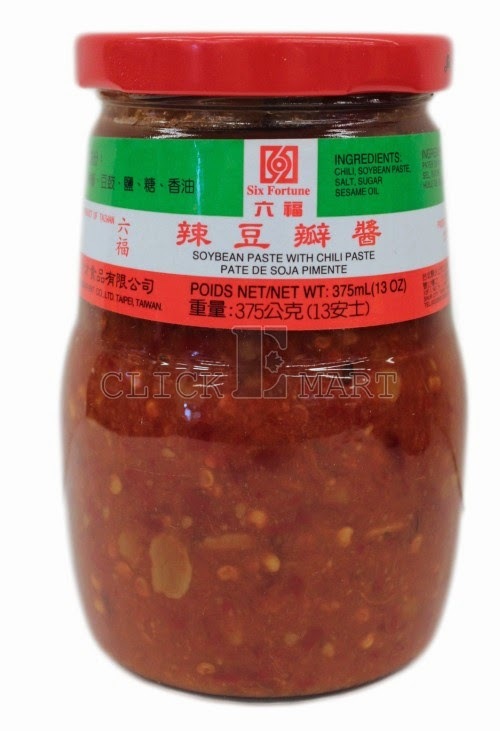 NOTE: About Szechuan chili garlic paste in the first recipe-- the best kind contains fermented soybeans, which give added flavor and umami to this condiment. 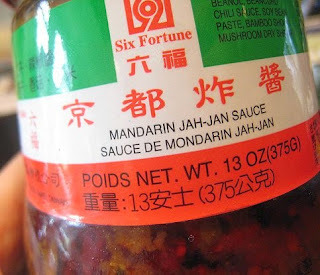 My favorites are Six Fortune Mandarin Jah-Jan Sauce (ingredients: vegetable oil, bean curd, chili sauce, soybean paste, bamboo shoot and mushroom) or Six Fortune Soybean Paste with Chili Paste (ingredients: Chili, soybean paste,salt, sugar, sesame oil), but there are other brands with similar ingredients. This is a very easy, versatile and delicious salad, which I adapted from a recipe in Deborah Madison's "Vegetarian Cooking for Everyone" (Broadway Books, NY, 1997) about 15 years ago. I often make it for potlucks or family gatherings, and invariably have several requests for the recipe. 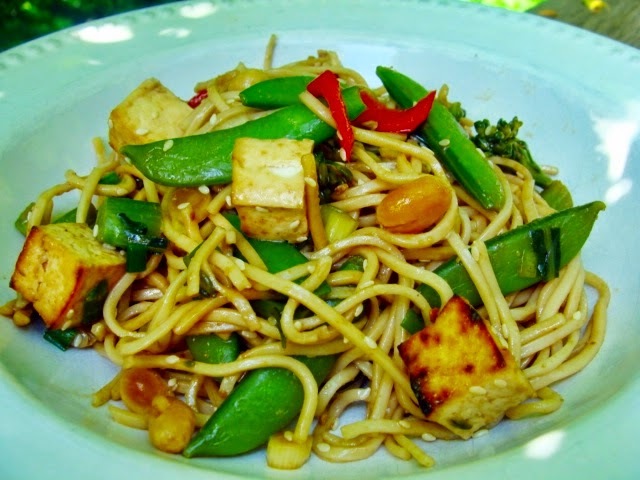 I've adapted it even more over the years to use various types of noodles, vegetables and vegan protein. strips of crispy "B of T"
Cook the noodles in a large pot of boiling water until tender. Run cold water over them in a colander. Drain well. Mix the Dressing ingredients together well and pour over the noodles. Toss well. Add the green onions, sesame seeds (and/or peanuts), vegetables, Protein of choice and optional red pepper slices, if using. Toss well. Store in the refrigerator, but bring to room temperature before serving. This is the new salad-- definitely worth repeating. 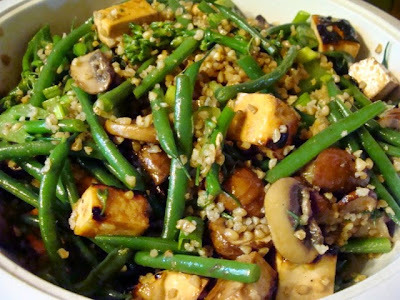 You could substitute other grains for the bulgur, but I love it's earthy flavor, which melds well with the sautéed mushrooms. 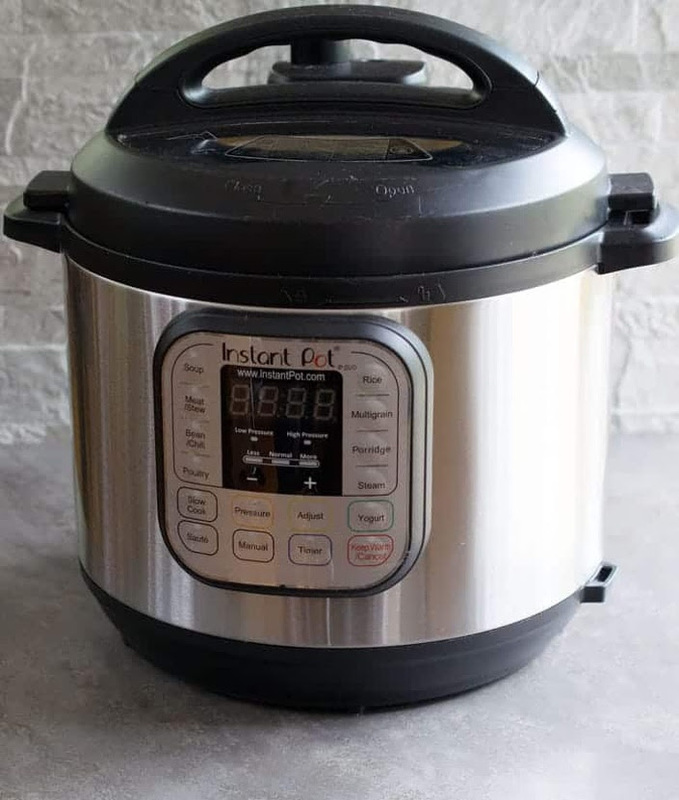 Bring the bulgur to a boil with 2 cups of water in a small saucepan. Turn down to low, cover and cook for 10-15 minutes, or until the bulgur is tender and the water all absorbed. Set aside to cool while you prepare the other ingredients. Plunge the green beans into boiling water and cook for 4 minutes. Immediately drain and plunge into very cold water to stop the cooking. Set aside to drain in a colander. Sauté the sliced mushrooms in a bit of oil until cooked to your liking. Set aside. Combine the tofu cubes with the soy sauce, brown sugar, sesame oil, ginger and garlic. Spread the tofu cubes on a rimmed baking sheet with the marinade ingredients and place about 4 inches below the heat source of your oven's broiler. Broil for a few minutes, watching carefully, until the cubes start to brown and stir them around to mix with the remaining sauce. Broil a few minutes longer, until browned to your satisfaction. Remove from the oven and set aside. 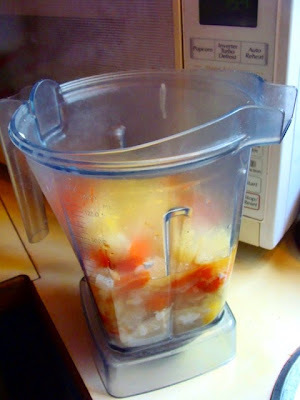 Whisk or blend together the Dressing ingredients. Fluff the cooked bulgur with a fork and scoop into a large bowl. Add the drained, cooked green beans, the sautéed mushrooms, tofu cubes and green onions. Mix well. Add the Dressing and toss well. Serve at room temperature. This was a rather spur-of-the-moment soup, but we really enjoyed it. 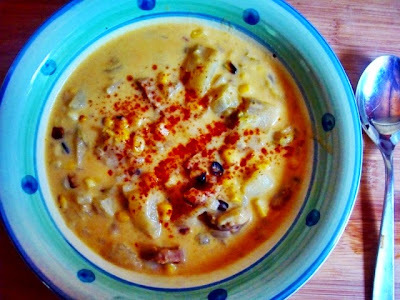 I had one Field Roast Chipotle sausage left (we haven't been able to buy them in Canada for a while, so this was the end of my freezer stash) and I felt like making a corn chowder, so I decided to make a spicy one. Then I thought of adding the jar of homemade Golden Cheesey Sauce to the pot and-- voilà-- a new family favorite has been born! 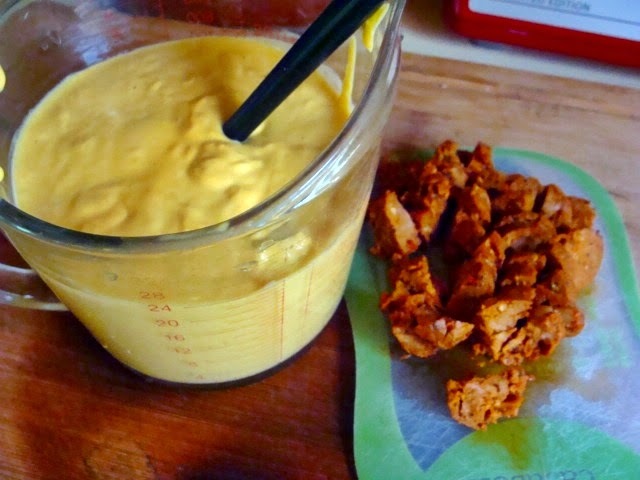 The Golden Cheesey Sauce is an updated version of the "Golden Sauce" from my very first cookbook, circa 1994. I've noticed that there are a number of new versions of this potato and carrot-based sauce going around, but it actually originated years ago in Seventh Day Adventist recipe books. I've made it a bit stronger-tasting than my original version. 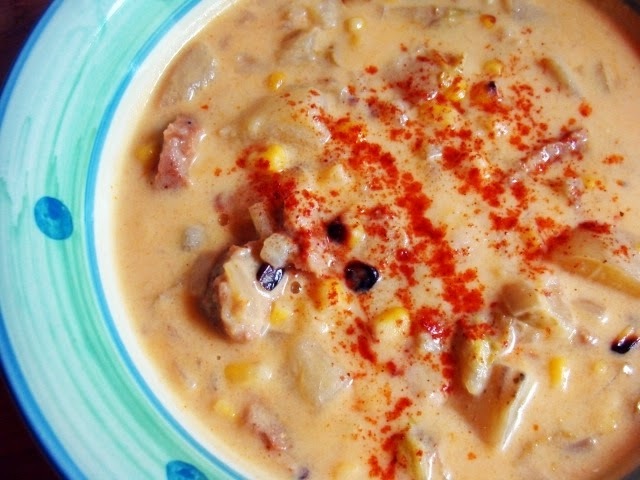 It's great on steamed veggies, as well as in this soup. 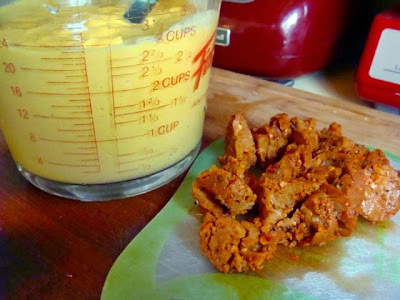 Optional: add 1 or 2 more tablespoons of nutritional yeast flakes if you want a stronger flavor. NOTE: For a *really* creamy soup, blend another 6 oz. of tofu (leftover from the Cheesey Sauce recipe) with a little of the soup until smooth, and stir it in at the end of cooking. Combine the chopped onion, garlic and celery. Sweat the vegetables in a non-stick pan over medium-high heat, adding a little water as needed to keep them moving. If you prefer, you can use a little olive oil. When they start to soften, cover the pan and let them steam in their own juices until soft. Alternatively, you can microwave them in a covered microwave-proof casserole or dish for about 5 minutes on High, or until soft. Spread the corn kernels on an oiled cookie sheet and place under your oven's broiler (about 4 inches from the heat source) and broil them until they start to char a little bit. Remove from the oven. Combine the cooked vegetables, potato cubes, and roasted corn kernels in a soup pot along with the broth. Bring to a boil over high heat, then turn down to a simmer, cover and cook for 10 minutes. Add the sliced sausage, chopped chipotle chile and the Golden Cheesey Sauce, along with any optionals you wish to use (taste first). Simmer a few minutes longer and serve. NOTE: For a slightly thinner sauce, cook the vegetables in 3/4 cup liquid. Cook the potato, carrot and onion in the water in a covered saucepan until the carrot is tender. Combine the vegetables and cooking liquid in a blender with the remaining ingredients. Blend until very smooth. CAUTION: Uncover the center hole of the blender lid and cover with a folded towel while blending, to prevent hot liquid from exploding! Use as a vegan cheese sauce on vegetables, etc..